One hundred and thirteen wounded service members from the James A. Haley Veterans Hospital — and their families — enjoyed an unforgettable steak dinner at Ruth’s Chris Steak House in Tampa, Florida, last week courtesy of Freedom Alliance. The wounded service members were all from the hospital’s Polytrauma Center, one of four nationwide that is designed to provide intensive rehabilitative care to those who have experienced severe injuries. Many attendees at the dinner are undergoing treatment for spinal cord or brain injuries. Freedom Alliance has now hosted two dinners for service members at the Tampa Polytrauma Center. Due to the severity of the patients’ injuries this dinner has a remarkable impact on all who attend. “You don’t know the real meaning of true love until you see a wife with her husband who is bound to a wheel chair and can’t speak and she keeps her hand on his shoulder at all times to let him know she is there for him,” said a Freedom Alliance volunteer. One young soldier’s entire spiral structure had been shattered just two months earlier and was given a 10 percent chance of survival. Astonishingly, he told Freedom Alliance he is scheduled to try and walk in the next week. Service members and their families enjoyed tasty appetizers and the restaurant’s famous steaks. A variety of decadent desserts were also served. “I really enjoyed this… my husband smiled the whole time,” said one of the service members’ wives in attendance. Many of the hospital’s doctors were present at the dinner to support their patients. 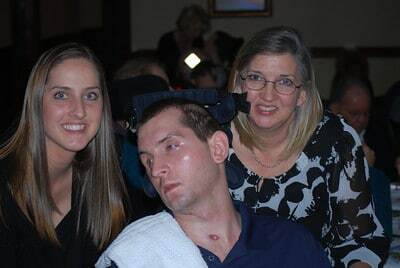 For injured service members a Freedom Alliance Troop Appreciation dinner is often the first public outing they attend. Many of the doctors reiterated the importance for the warriors to enjoy time outside of the hospital environment. Troop Appreciation Dinners are just one component of Freedom Alliance’s support for America’s armed services. Freedom Alliance has awarded more than $4 million in scholarships for students who are the dependents of Soldiers, Sailors, Airmen, Guardsmen and Marines who have been killed or permanently disabled in an operational mission or a training accident.